Dad of David and Papa to Lilly, David Sr loves to come to all of Lilly’s events to lend a hand and bring the laughs. He’s always so thoughtful to bring hot soup or pizza for all of Lilly’s helpers. Big D has been a long time pit bull lover and currently cares for a pit bull named Kane and has a grand-dog named Sasha. 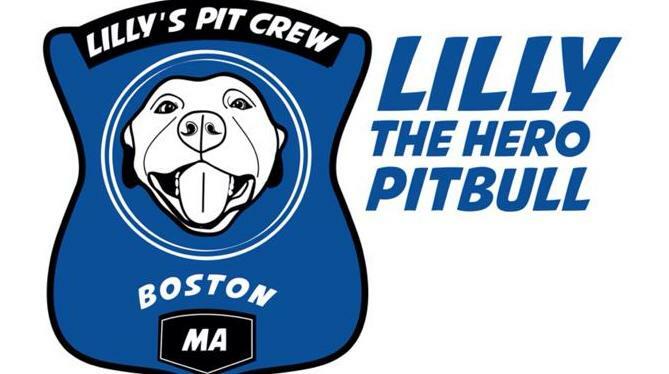 Cathy Adrian from Lowell MA started falling for pit bulls about a year ago when she began volunteering at the Lowell Humane Society. When she met Lilly this summer, she became completely smitten with the breed. Pit bulls have now joined Labradors as her 2 favorite breeds. A Burlington resident Lynsey is an Assistant District Attorney. As part of her job as a prosecutor, she has been fortunate to be able to use her law degree to do some good for animals by being their voice when they are victims of crimes. Her passion for animals and for pit bulls began a little more than 6 years ago when she adopted her Pit Bull/American bulldog mix, Tyson (shown with her above). She has been a proud pit bull owner ever since. She was fortunate to have the opportunity to intern with the advocacy department at the MSPCA and do research on breed-specific legislation, learning how ineffective and inefficient these discriminatory laws are. Lynsey is constantly seeking ways to help dispel the media’s portrayal of pit bulls as inherently dangerous. did not have much experience with pit bulls until she was hired as a nanny for a family with two human children and two pit bull children just after graduating college. Although she had very few preconceived notions about the breed prior to working with this family, she was surprised to learn how intelligent, gentle and affectionate these dogs were. Since this experience, she has had the pleasure of meeting a number of other pit bulls who are usually more interested in snuggling and playing than living up to any negative stereotype. Molley has come to love the breed and is proud to have the opportunity to volunteer with Lilly in raising awareness on the true nature of these dogs. Janice became involved in animal rescue in Feb 2002 at Salem Animal Rescue League in Salem, NH having never meet a pit bull nor aware of any reputation they may have had. For the next 4 months, she and a handful of volunteers cared for 5 of the 43 pit bulls seized as state’s evidence in a dog fighting, animal cruelty case. While in their care, they were greatly moved by the pit bulls’ loving natures, even after the treatment they had been subjected to. Their names: Martin, Luther, King, Junior, and Danner. Junior (pictured above with Janice) was to be Janice’s first pit bull love. At the end of May, it was determined all the dogs had been trained to fight and could not be rehabilitated and placed in homes. On May 22, 2002, they were forced to load their 5 boys on a truck to their final destination. Deeply affected by this, Janice has been an advocate for the breed ever since. In recent years, Janice and her husband Andrew, along with the help of their own 3 dogs and several cats, have fostered and found homes for as many pit bulls as they can for Salem Animal Rescue League. Janice met Lilly at her Littleton, MA event in June 2012 and enjoys helping Lilly meet her fans at Lilly’s events. Julie fell in love with pitbulls 4 years ago when her dear friend Shaun rescued a little red nose boy named Cassius who showed her just how amazing these dogs are. Since then she has been advocating for bully breeds every chance she gets. She believes its very important to be their voice and change people’s perceptions of pitbulls. There are too many of these beautiful dogs sitting in shelters and dying every day because of the stigma attached to them. She has been following Lilly’s story since day one and when she met her in July, fell head over heels in love and had to join the team. An avid dog lover, she’s a mom to two labs, Ozzy and Zakk and a bullmastiff named Jake.